First responders need top-of-the-line clothing, equipment, and information systems to do their jobs, yet as technologies evolve to meet the needs of consumers, military, and the private sector, many first response units are left behind. For our nation’s first responders, a job well done is one that goes largely unnoticed. When a call comes into a fire, police, or EMS unit, they rarely know what awaits them on the other end of the line. They only know that they must move quickly, think clearly, and take action. Just how they respond often means the difference between a life saved and a life lost, between news headlines and nothing out of the ordinary. First responders need top-of-the-line clothing, equipment, and information systems to do their jobs. Yet many first response units across the country are finding themselves left behind, as technologies evolve to meet the needs of consumers, military, and the private sector before their own. Pacific Northwest National Laboratories (PNNL) came to us with the goal of defining a vision that would inspire and guide interested, able companies to address this need. PNNL asked our designers to imagine the future of first response: What will this work look like in ten to fifteen years? What tools, apparel, and IT systems will first responders need? And how can this future vision be made real? We launched the project with a series of workshops for first responders in Seattle, Boston, and San Francisco. Fire, police, and EMS workers from all over the country came together to articulate their most critical needs and generate ideas for possible future-state tools. Industry partners also attended, including many who were already developing relevant technologies for other markets. This industry presence proved invaluable, as it inspired first responders to imagine more fully what was possible. To understand the full scope of the work, we needed to balance the two contexts in which first responders operate: on the routine calls of a daily shift, and in the less frequent but more large-scale states of emergency. We shadowed Boston Fire, EMS, and Police in "ride-alongs," to observe their daily challenges and the resources used to address them. As this offered only a partial picture, we also facilitated small group share-outs. Members of each agency described a large incident in detail: essential tools, challenges, workarounds, and stories of success. Bringing leaders from the first responder community together with key players in government and industry, we helped PNNL to define a vision for the future of first response. This encompassed the individual first responder’s clothing, tools, and transportation needs, as well as the broader systems integrations required for a team to operate more effectively—and save more lives. To articulate this vision, we provided PNNL with a series of videos dramatizing how our solutions will function in the context of police, fire, and EMS work. We also provided a “prototype box,” which housed high-fidelity mock-ups of our concepts. Not only could people pick up and touch each component of the system we’d designed, but they also could engage with interactive digital tools to experience each solution in the context of an actual emergency. 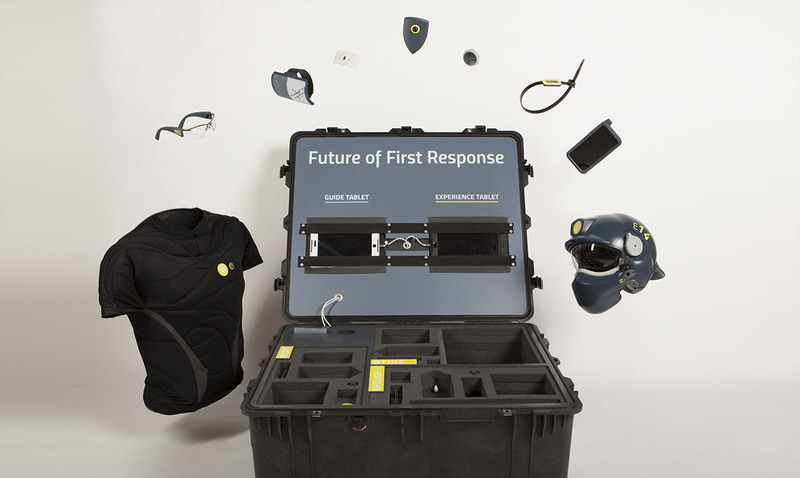 Our vision for the future of first response, as well as our working prototypes, received positive reactions from not only PNNL, but from the Department of Homeland Security Science and Technology sponsors, and most importantly, actual first responders. The prototype box currently travels around the country, inspiring first responders and generating enthusiasm and demand for the products and technology it houses. Our designers are also helping PNNL to engage potential industry partners and build support for the development of the future vision concepts. The MIT Media Lab dreamed an affordable kids' information device. We prototyped it.